Chicken with cashews is an extremely popular and tasty dish in restaurants worldwide. This delicious and simple dish is pretty easy to make in a wok or skillet & tastes amazing. 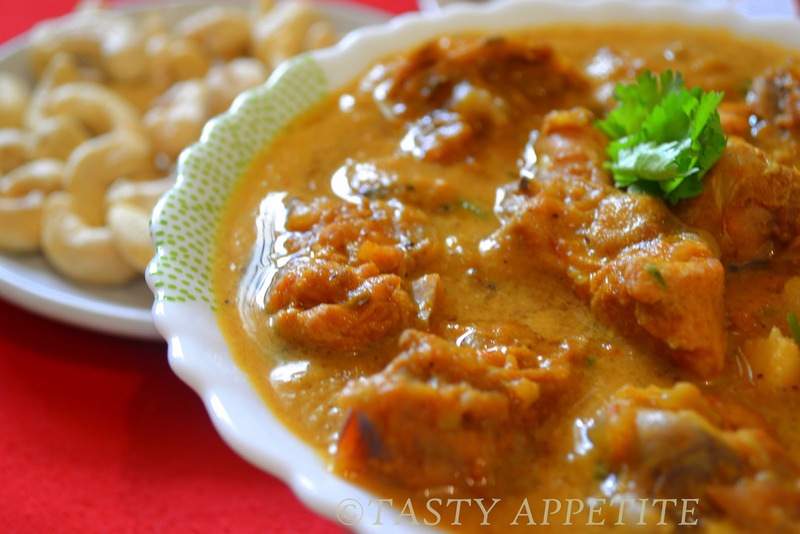 In this recipe, the chicken is cooked in cashew paste with very little spices. The rich combo of chicken and cashews, makes an appealing healthy favorite dish of both kids & adults. I love all of the different flavors and textures in the dish and no doubt this nutritious recipe has quickly become our family favorite ! 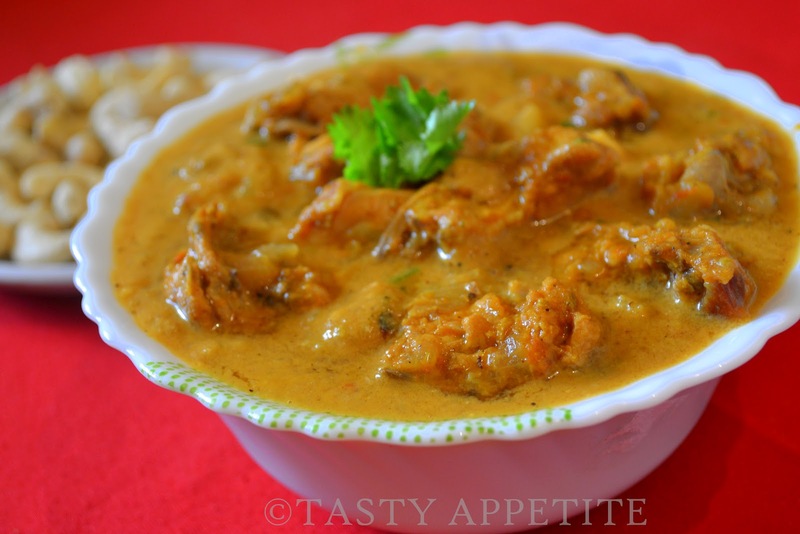 Chicken cashew makes a great dish for lunch & dinner. Make the best Cashew Chicken with this easy recipe & enjoy..! Clean and wash the chicken thoroughly. Marinate the chicken with the marinade prepared with the ingredients mentioned. Allow to marinate for 1 hour. Make a paste of cashew nuts with milk. Add cinnamon, cloves, curry leaves and saute. Add finely chopped onion and green chillies, and fry till onion becomes light brown. Now add tomatoes mashed, salt and saute well. Add the marinated chicken and start stirring. Add 1 cup water and allow the chicken to cook covered in medium flame. Once the chicken is tender, stir the gravy. Add pepper pwd and check for salt & seasonings. Now add the cashew paste and allow to boil for 2 to 3 mins. Serve hot with Idly, dosa, chapatti or roti. It goes well with any kind of main dishes. Awesomeeee.......delicious recipe dear......somthin special for someone special!!!! Jay, this looks so rich and delicious! 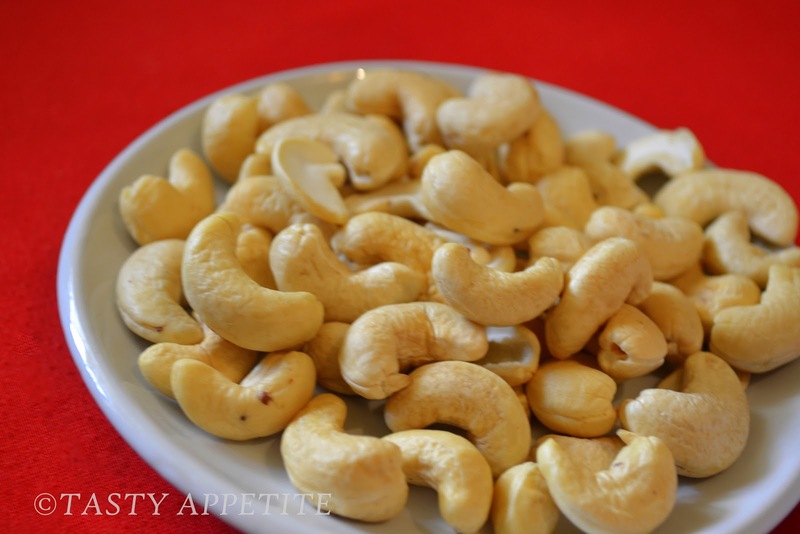 Love cashews and can't wait to try it! very rich chicken gray! !yum yum! very rich, super delicious chicken..looks yum..
One of my favorite chicken dishes. Mouthwatering! Can't wait to give it a try! Like to eat it with chappati...yum yum.. The gravy is so rich and creamy..I love the flavor of this Jay. 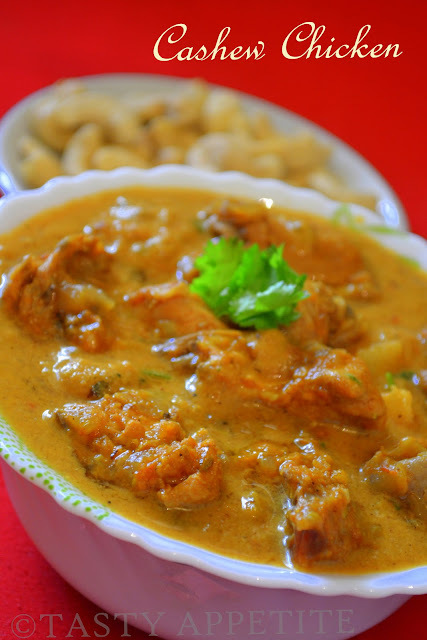 Chicken, curry and cashews whats not to like in this dish! I can take it alone and finish off the gravy. That looks very creamy and rich. It looks delicious enough to eat directly from the bowl! I am hungry after seeing these shots! I really love this dish, it looks tasty! Oh yeah, cashews! I love them - and this looks delicious. Thanks for this. This looks so good! I'm starving! Yummy dish!I love cashews!Have a lovely week! 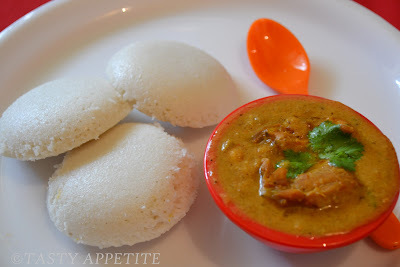 yummy yum deliciously done..lovely thick gravy with idlis!! Looks beautiful, sounds delicious - I am IN! Chicken and cashews are just one of those matches that it's hard to beat in cooking. This looks delicious! thanks for stopping by and taking the time to browse.. I appreciate all your comments, feedback and suggestions.. I love curry and cashews. It is a popular meal indeed. It looks really DELICIOUS !!! Love that dish ! very inviting curry !! too tempting too !! Thanks for linking to the event !! Cashew Chicken is one of my favorite dishes! How can you go wrong with cashews? A must-try Recipe Jay!.Appetizingly done and displayed.Yumm! WOW... So mouthwatering. Nice recipe. Looks so good. YUM! wow yet another yummy for tummy! love cashew chicken. need to flag this.